If 2 or more cards are in the same column, you can Special Summon this card (from your hand) in that column. You can only Special Summon “Mekk-Knight Purple Nightfall” once per turn this way. (Quick Effect): You can target 1 “Mekk-Knight” monster you control; banish it (until the Standby Phase of your next turn), and if you do, add 1 “Mekk-Knight” monster from your Deck to your hand, except “Mekk-Knight Purple Nightfall”. You can only use this effect of “Mekk-Knight Purple Nightfall” once per turn. Purple Nightfall is the next Mekk-Knight we are looking at. Level 8 and LIGHT lend good synergy with Trade-In and Honest. When you can Special Summon a 2500ATK monster from your hand if there are 2 or more cards in the same column, it’s great, and that’s what the Mekk-Knights do. Set a spell/trap in the same column as your opponent did and you are golden. Banish to add another Mekk-Knight from the deck is a good search, made even better that you can do it in response to a card effect to potentially save your other Mekk-Knight. You also get the banished Mekk-Knight back at your next Standby Phase, resulting in a +1 at the end. Purple can even target itself to save itself from something like a Bottomless Trap Hole off its summon, get your search, then come back next turn. Purple can search out Blue, then Blue can get you more searches in the same turn. This deck can search through itself fast and swarm if the conditions are right. Going second is what this deck wants to do. A good searcher on a big enough body. Mekk-Knight Purple Nightfall is a Level 8 Light Psychic-type monster with 2500 Atk and 2000 Def. Like all Mekk-Knights effect monsters, Purple can be Special Summoned once per turn by having 2 or more cards in the same column. Realistically, this is only possible going second or with Grinder Golem, Gofu, or something like that. The theme effect is good but the individual effect is what makes Purple Nightfall necessary. As a hard once per turn Quick Effect, Purple can target any Mekk-Knight on the field for banishment, then you get to search any Mekk-Knight except another Purple. The banished monster returns during your next turn. It can target itself and prevent undesirable effects, give you search, and then Special Summon the searched Mekk-Knight to the same column. Mekk-Knights are new and shiny, so they needed a good searcher. Run 3 Purple Nightfall for use with Trade-In and Back to the Front. Score: 4/5 Art: 5/5 They are all very nice to look at. Next up for the Mekk-Knights is the other searcher for the deck, Purple Nightfall. Purple Nightfall is a Level 8 LIGHT Psychic with 2500 ATK and 2000 DEF. I made my opinion clear on LIGHT and Psychic already and will not really go into details again. Level 8 is a good Trade-In target and the stats are ok for the Level. Just like all the main deck Mekk-Knight effect mosnters, Purple Nightfall has the Mekk-Knight Clause. For a hard once per turn during either players turn, you can banish a Mekk-Knight you control until your next Standby Phase to search for any Mekk-Knight monster excluding Purple Nightfall. Again, searching is a great thing to have and it is nice for Mekk-Knights to have two searchers for their archetype. This one can get you a search and clear a column for you to summon another Mekk-Knight to, which you are searching a Mekk-Knight. Purple Nightfall, just like Blue Sky, is another three of for the deck. Art: 4/5 The Secret Rare is nice, but Blue Sky is superior in the art department. 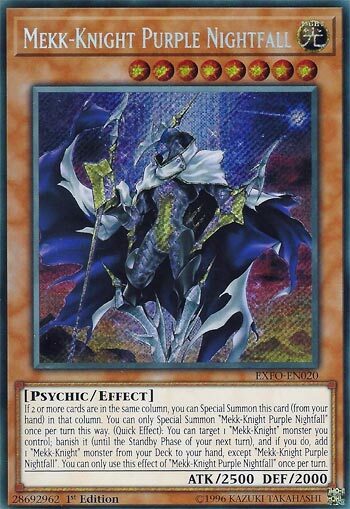 Purple Nightfall is the Mekk-Knight today, and this card is a Level 8, Light, Psychic Monster, with swapped atk/def from yesterday, being 2500-2000. So, as we heard, two or more cards in the same column gets Purple Nightfall Special Summoned to that column, from the Hand. I like this Knight is stronger, though 2500 on Level 8 is meh. This guy has a Quick effect to remove one of your Mekk-Knights from play to add one from your Deck to your Hand. Said Monster returns during your next Standby Phase. This guy has the same once per turn clause on his effects, so let’s compare a bit. More attack is good, and the temporary removal effect can work in your favor too. He may not generate the cards you need as fast as yesterday, but he’s still more or less as good.